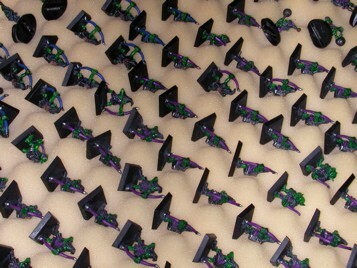 Thirty two goblins with short bows came in the original boxed version of the Warhammer rules. It was common to field them as Night Goblins. I have over 64 of these guys that are base coated and thus 'useable' by GW store and tournament standards. I was even helped getting them to this state by some GW staffers. They still have never been fielded since they were glued together and painted. I'm hoping to get an actual 1000 point army done real soon now. I divided the archers into two units, one is 20 or so models and the other is 40 or so models. They are painted with blue and purple trim respectively. I think the purple unit is the bigger one. I painted the spearmen with purple trim and plan to use them as regular goblins. If you look closely you can see some fanatics and even some of the even older plastics that came in the Fantasy Fighters box.